Where are we thinking of putting the new building? You may be thinking, “I know we have a lot of land here – where are they thinking of building this new building?” Great question! It is true that we have a lot of property here – about 32 acres, in fact. But we also have some constraints on where we can build buildings. When we developed this property to start with we had to apply for a Special Use Permit with the Town of Chapel Hill. Part of that was a master site plan. The illustration below shows part of the map of our site. The green outlines show where our master site plan has buildings that have already been approved as to their placement. 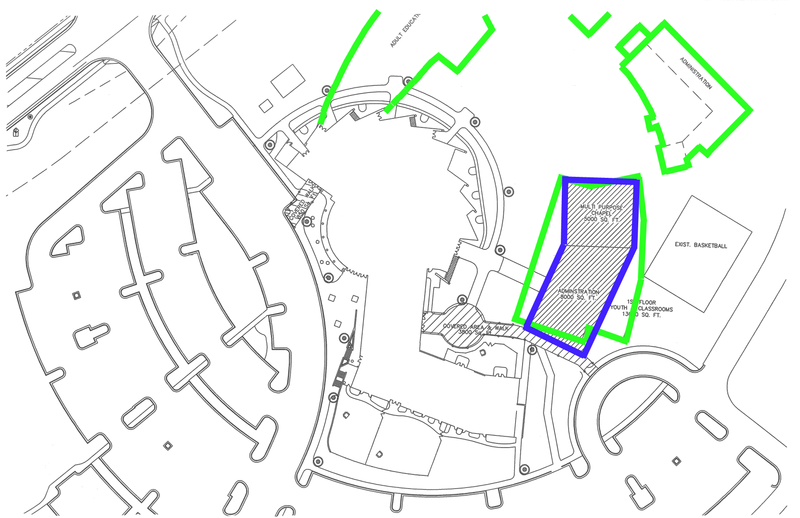 (Note that the drawing does not cover our whole property – the green outlines that go off the top of the page are parts of buildings on the master site plan, too.) According to the Town, if we plan to build where a building has been approved, we will have only to get the specific building permits and inspections. We will not have to go back through the whole Town of Chapel Hill process of getting a site plan approved. Not going through the whole process will save us time and money – on the order of many months and thousands of dollars. Therefore, we want, as much as possible, to build a building where we have already been approved to build one. The blue outline shows what we are currently thinking of. It is largely within a green outline, so would be a simpler matter to get the final permits. Given that the strategic plan places a strong emphasis on church planting, why aren’t we considering planting a local church as a means to releive space constraints and further sharing of the gospel? Great question! This is a big topic and rather than giving a short answer here, we are going to make it the subject of a future blog post! Make all upstairs and downstairs classrooms for all children’s ministry. Move youth rooms to the new building multipurpose area. Move adults to current admin area. Looks like current admin being moved to new building. Sorry, Mike, to have neglected to reply to this for so long! We have considered several of your ideas and are currently thinking that youth, offices, adult classrooms, and a large-ish chapel or multi-purpose space will be in the new building. And yes, both upstairs and downstairs in the current educational wing will be devoted to children’s ministry. Thanks for the thoughts!